*Sportsmatch makes mounts specifically for the FWB Sport. 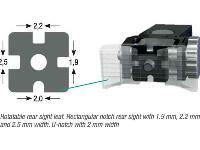 The mounts have special hardened crosspins that will fit into one of the 5 shallow slots. Because of the renewed worldwide interest in sporting air guns, Feinwerkbau is diving back into production, and they've come out with the Sport as their premier springer for the new millennium. 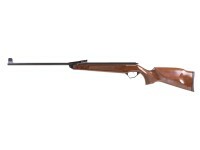 FWB has combined its spring-piston knowledge with state-of-the-art technology and machining, 21st century metallurgy and modern production methods to produce their new sporting air rifle. 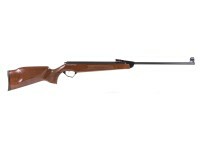 This all-round gun is suitable for dispatching rodents, shooting bullseye targets and plinking. Things I liked: Balance, firing, cocking, carrying--it is easy to use anytime anywhere without extra equipment. Just break the barrel and put in a wadcutter or crow magnum type pellet and see power with accuracy. Open sights have precision machining and milling for sharp definition. Firing is more like a Theoben Eliminator (Gas Ram)--fast and a bit violent but extremely short. Power is on par with HW80. Many times I imagine the perfect one rifle for all and this is the closest I've seen. Is it perfect? To me, yes. Things I would have changed: I would actually like to see if the sight system on the Walther Terrus could be transferred to the FWB SPORT for the fine optic fiber work Walther uses in that rifle for front and rear sights. However, not all people like optical fibers in their iron sights. I just happen to. What others should know: Worth the $800 or so easily. No mystery to me how the money was used to put this together at 8 lbs. Things I liked: Accurate, Light weight, slim profile and vertical pistol grip. 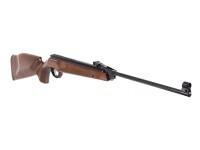 This is the only break-barrel coil spring airgun that I know, that is more accurate than my HW97K, Pro-Sport and TX200. 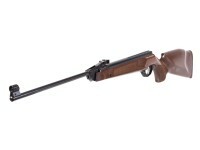 It shoots one rag-hole 5-shot at 25 yards using JSB Express. The ergonomics feels good and well balance in the off-hand position. Things I would have changed: Made it easier to break barrel open, get rid of the strong recoil and allow trigger pull weight to be adjustable down to 8oz. Better Metal finish. What others should know: The firing cycle and power output are a lot like my HW35 except recoil is stronger and sharper. No Tune kit for this gun as of today. The trigger is light but NOT predictable. I cannot feel where it "breaks." When new, I chrony it using JSB 8.4g, shooting an average of 844 fps (13.3 ft-Lbs) and after 300 round, the gun is now shooting 13.7 ft-Lbs. An easy way to break open the action is to apply a one cocking motion, begin with a quick jerk and continue cocking. Things I liked: Great stock. I bought the rifle in 2105. It was advertised at 900 fps. When I shot tin cans at 25 yards, it barely dented the cans! My chrony clocked at less the 600fps. It was brought to my attention that mine was a 7.5 joule gun. 5.5 foot pounds. so I called Pyramyd Air. So I sent the rifle in and they replaced the spring! Now the 7.1 grain pellets go over 1000 fps. 10.65 grain H&N at 775 fps! Good job Pyramid Air. The workers done by Air Venturi!! Things I would have changed: You have to really "pound" the barrel to "break" the barrel. What others should know: Wear a heavy glove to "break" the barrel. I am happy the the upgrade to my rifle!! Does Sportsmatch have a mount with the hardened crosspin but for a 30mm scope tube? I can only seem to find a version for a 1inch tubed scope. What is the noise level (decibel)? Are Sportsmatch mounts required? Will BKL drooper mounts work? Most people just shim whatever mounts they have, which I did with my old FWB124 as well and it works fine. Just be wary of the reverse recoil and lack of a pin hole so you need one with good clamping force. I used a Centerpoint version of this guy; Leapers Accushot 1-Pc Mount w/1"..., then drilled/tapped it for two more screws. Actually the three seemed to hold fine but I wanted the extra and the look. Optionally Leapers Accushot 1" Rings, Medium,... should be fine too. My 124 has the same grooves on the rail (no pin hole), so back before cool mounts I had to improvise by using a brass rod in one of those grooves and ground a matching recess on the underside of a generic 22LR mount to accept it. Pita... The mounts I mentioned are exceptionally strong and look great, yet super cheap. Just be sure to remove the stop pin in the mount, don't want it working its way down and scratching up that nice gun. Recommended, not required in my opinion.